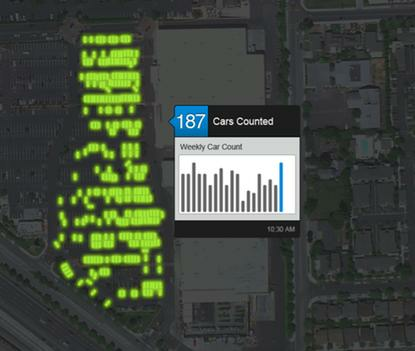 Skybox's technology can analyze changes like the number of cars in a parking lot. Google stands to gather massive amounts of geographic data for information as wildly diverse as the health of farm fields and congestion of parking lots, by purchasing the super-smart satellite imaging and analytics company Skybox Imaging. The companies said Tuesday that Google was paying US$500 million cash to acquire 5-year-old Skybox, which claims to have made the world's smallest high-resolution imaging satellite, which collects a range of images and video of the world's daily goings-on. The deal has not yet closed and is subject to customary closing conditions. Google, in its announcement, said that Skybox will help keep Google Maps accurate with up-to-date imagery. Google already uses satellite imagery for its Maps and Earth software, but the data can be between one and three years old. But the possible applications of Skybox's technology go way beyond Maps. "Over time, we also hope that Skybox's team and technology will be able to help improve Internet access and disaster relief -- areas Google has long been interested in," Google said. Those are oft-cited goals at Google now. The company said the same thing after it recently acquired Titan Aerospace, which makes drones that fly at 65,000 feet to beam Internet access to underserved parts of the world. Skybox's technology, like Titan's, may also hook up with Google's Project Loon, an experiment involving high-altitude balloons for Internet access. And it could give Google a big leg up against Facebook, which has its own drones for Internet and other projects. But Skybox's technology is impressive by itself. By analyzing its images and video, the company provides intelligence on all sorts of industries and activities on Earth -- data that Google could eventually incorporate into any number of its products. Skybox, for instance, looks at changes in the number of cars in a retailer's parking lot, or the size of stockpiles of natural resources in ports, to provide financial trading intelligence. "The time is right to join a company who can challenge us to think even bigger and bolder, and who can support us in accelerating our ambitious vision," the Mountain View, California-based Skybox said in its announcement. The company also looks at rock topologies and geological structures for mining operations monitoring, and monitors refugee movements in conflict areas to aid humanitarian efforts. Skybox even does maritime monitoring for ships -- Google Maps cruise transit options, anyone?